Important announcement: Episode 3 of The Book Blab has been rescheduled for Friday, February 5th (that's tomorrow!). We're trying a new time, so you can watch us live (right here on the blog) at 9:30 AM Mountain Standard Time. Suzanne and I will be discussing reading goals, as well as sharing a couple of book recommendations. We hope you can join us! 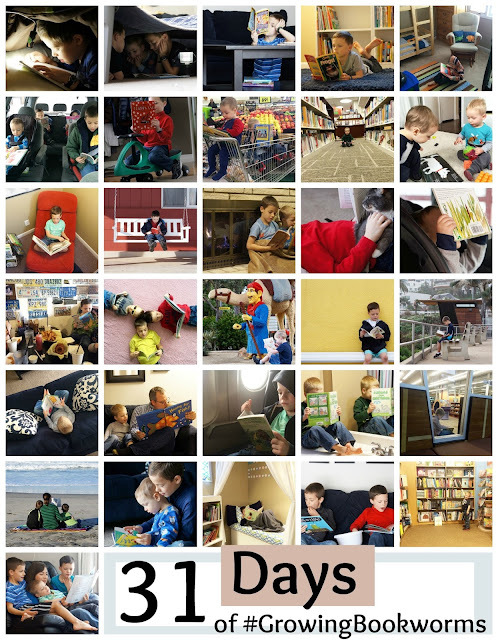 During the month of January, I participated in an Instagram challenge to photograph my kids reading in 31 different places. It was organized by Jodie at Growing Book By Book, and it was a lot of fun. I had the challenge list running through my head all month and kept books close at hand so that no matter where we were, we could get a picture if we found the perfect spot. My kids were such good sports about it. During the last few days, Aaron even begged to be in all the remaining pictures because he felt like he hadn't been represented enough. The challenge didn't receive a lot of participation, and I think I was the only one who actually finished it. My kids wanted to know if I was going to get a prize. I think they couldn't understand why I took something so seriously if there wasn't any external reward, but I am highly motivated by check marks, and for every day in January, I got one. That's reward enough for me. 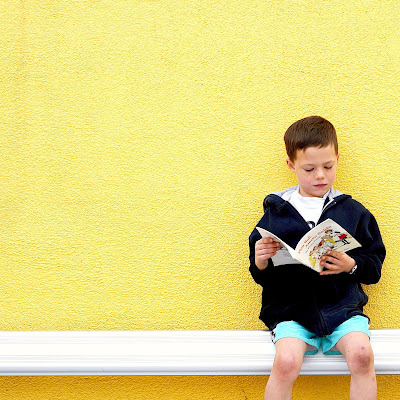 For more book recommendations and snapshots of our daily life, follow me right here on Instagram. Thanks, Dena! I'm happy I did it. I'd love to participate next time. Yes, I think you'd have a lot of fun with it, Erin! I loved seeing your pictures every day. You should win a prize for completing the challenge! :-) Thanks so much for participating. Thanks for organizing it! I had so much fun! These are great pictures! Love this!